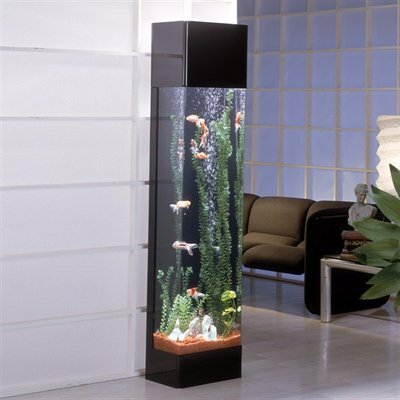 Tower & column aquariums have become a highly popular way of having a fish tank. Shapes vary from hexagonal to round to oval. Ranging from only 18 inches tall to 6 foot high they can be compact and bijou or imposing and striking. Whilst the smaller tanks are fairly reasonable in price, the taller ones can be very pricey compared to a similar litre capacity tank of normal shape. This is mainly because the glass is a lot thicker to withstand water pressure especially on the lower half of the tank. After all a 6ft tall tower tank can contain 200 litres of water. These tanks can be ideal for those who want a larger capacity tank but do not have the space. They create a really good 360 degree view of the fish in the tank. Care must be taken though not to place them in direct sunlight. On the flip side owning a tower tank can be quite beneficial when you are looking to create an enjoyable environment for your fish. Of course, you can add plants to any tank you purchase but the advantage that you receive from purchasing a tower tank is the chance for your plants to grow taller and reach their full potential creating a beautiful scenery. If you have small space to work with and want to avoid taking up so much room, tower tanks can be the answer. They can easily be placed in a corner out of the way allowing you to make the most of the room it’s placed in. Not only that but they look stunning and add a touch of flair and ambiance to your home. 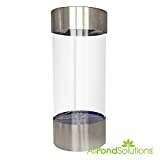 Tower tanks are also recommended for specific fish such as angelfish which can grow up to 8 inches in height. It will give them all the room they need to flourish and swim freely. Tower tanks however are not the ideal home for most fish. Fish in general do not live in deep water and the pressure at the bottom of a 4, 5 or 6ft tank will be too high for them. Aeration can also be a problem in the taller of these tanks. A water flow system must be able to move the oxygen rich water to the bottom of the tank. This usually proves to be no problem when a tank is not taller than it is wide. The tower tanks however can have 6 feet depth for the flow system to cope with. Low oxygen in the bottom of the tank will result in a breakdown of fish waste building up noxious gases which can be harmful to the fish. Tank maintenance can also be a nightmare as it is impossible to get your hand to the bottom of a tank that is as tall, or taller than you. This can be solved however by buying specialized cleaning brushes for tower fish tanks. Your brush fit all size of fish tank,the head of the brush can clean everywhere of your aquarium. 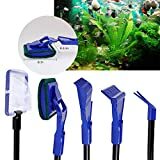 5 in 1 multifuction:your brush able to clean the inwall of fish tank ,gravel,seawood,nip water plants,and nnetting fish. Meet the ergonomics design:easy to use,you will fell confortable when you hold it. Save money,time ,and space.you will get high performance with friedly price . Satisfy different works of cleaning fish tank .You're Worth It. If a tower tank is something you are looking to purchase, the best place to start is by knowing which fish are the best suited for this environment. Not many fish prefer tower tanks but you will find that angelfish, gouramis, and discus fish do thrive better inside of them. This is important to take notice of as most people and especially anglers tend to have a specific selection of fish they like. The least preferred fish type for a tower tank is going to be anything small. They just won’t fill out and decorate the tank properly unless they are mixed in with larger fish to balance it out. It is also important to be aware that tetras which are a small fish but favorable, tend to float to the top of the water tank and since they are jumpers you’ll want to make sure you have a secure tank top or you’re going to experience a lot of trouble. Ultimately, owning a tower tank can be easy and well worth the experience as long as you can keep up with it and care for it properly. Understanding what type of water environment and pressure the fish of your choice prefers and can handle is also going to go a long way in the process of setting up your tank correctly. Also be aware that the taller the tank, the harder the pressure will be at the bottom so you want your fish to be able to survive in it. To ensure that your plants are able to flourish in the tank as well, you are going to need a stronger set of lights than the usual fish tank.